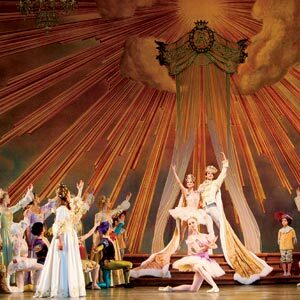 New York City closed its Tchaikovsky-themed winter season with two weeks of performances of Peter Martins’ staging of Sleeping Beauty. I always think of this this great classical ballet as a luminous example of the triumph of form. When all the elements come together—musical interpretation, sets and costumes, grandeur and detail in the dancing—I feel an irrepressible surge of emotion at its splendor. Watching its patterns unfold is like a visit to Vaux le Vicomte: how could something be so beautiful, so elegant, so harmoniously grand? Tchaikovsky’s music conveys this feeling with ardor and a kind of blind belief: the longing for things to be made right (just think of the cello solo in the Vision Scene), the lure of fantasy (think of the sparkle of the Bluebird pas de deux), the glorification of harmony (the horns in the wedding pas de deux), the delight of ensemble dancing (the irrepressible drive of the Garland Waltz). In Sleeping Beauty, one easily recognizes the antecedent to Balanchine’s Theme and Variations and Tchaikovsky Piano Concerto No. 2, and the luminous finale of Symphony in C.
Teresa Reichlen as the Lilac Fairy in Sleeping Beauty. Photo by Paul Kolnik. Every balletomane has his or her ideal version of the ballet. I’m not sure I’ve yet seen mine, but in the absence of perfection, and despite some reservations (mainly about its rushed pace), I have great admiration for Peter Martins’ staging for New York City Ballet. The scenery, by David Mitchell, is really quite beautiful. Mitchell uses projections of châteaux and landscapes to create a sense of space, inviting the audience to envision the story from afar and then experience it from close at hand. I especially love the way the projections slowly pan out, in a series of still images, from the courtyard where Princess Aurora’s birthday celebrations take place to the exterior of the castle, the forest, and then the entire kingdom, with just a small spire in the distance to suggest the castle’s isolation from the world. Then we fly high above a long, meandering river to the forest where Prince Désiré cavorts half-heartedly with his guests. Like Tchaikovsky’s pulsing music at this point in the score, the voyage through space also suggests a voyage through time. The Prince’s hunting party occurs one hundred years after the original events, in a setting that evokes by Watteau’s Fêtes Galantes. Mitchell’s autumnal scene, with rust-colored foliage and a river glistening in the distance, is very handsome, as are Patricia Zipprodt’s deliciously detailed costumes. I especially love Aurora’s slightly faded white tutu in the wedding scene, with a fine chain extending from the bodice and around the upper arm, accentuating the épaules, one of the loveliest parts of a dancer’s anatomy. Zipprodt’s colors are muted and faintly “antique,” thankfully free of the garish Disney-quality so often used in fairy-tale productions. The hunting scene, however, reveals one of the staging’s nagging problems: an unwillingness to allow the story to take the time it needs to build atmosphere. No sooner have the Prince’s companions arrived that they are sent scurrying off again. An entire scene, along with its mime and courtly dances, has been cut. The scene no longer makes sense, except as an elaborate excuse to introduce the Prince. (An expensive excuse, too, since the costumes in the scene are quite sumptuous.) Similarly, the fairies’ individual solos in the prologue, each of which is meant to embody a quality presented to the young princess as a gift, are danced at such a clip that meaning and cleanness of execution are inevitably sacrificed. The dancers do their best, but they look rushed and rather pained. It’s a shame, because these are wonderful little miniatures, each with its own quality and perfume. Balanchine’s “Garland Dance” in “Sleeping Beauty.” Photo by Paul Kolnik. Martins has left many passages of choreography untouched: the Rose Adagio, the Vision, Balanchine’s glorious Garland Dance (with its necklace of little girls threading through the patterns), Bluebird, the Wedding pas de deux. Martins’ fairy-tale divertissements—especially Little Red Riding Hood, featuring another little girl from the company school—are especially pleasing. Martins has a knack for character dances, especially those for children. I also admire his homage to Balanchine during the Wedding divertissements, a pas de quatre with jewel tones: Emerald, Ruby, Diamond, Gold. The third variation, for Diamond, is quite tricky, with its syncopated, accented music, to which he has set complex phrases of hops on point. I always look forward to it. That said, the company doesn’t always dance Sleeping Beauty with the sparkle it deserves. The mime passages are rather vague, and the courtiers often look stiff and lost rather than noble and engaged. NYCB’s dancers are not trained to act, and the ballet’s extreme classicism can leave them looking rather exposed. For all these reasons, especially toward the beginning of the run the ballet didn’t quite cohere. Tiler Peck, who had been so wonderful in her début as Aurora a few years back, now looked like she was trying too hard to “sell” the character. Aurora isn’t really a character anyway, more like a series of essences: child-like charm, dreamy longing, womanly grandeur, joy. 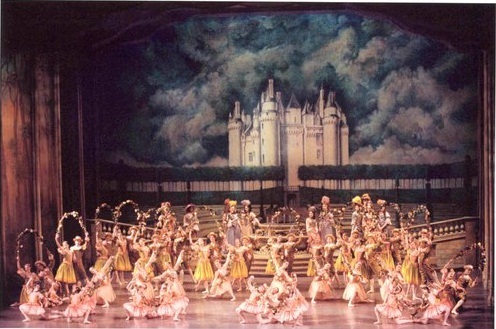 The final tableau in Peter Martins’ Sleeping Beauty. Photo by Paul Kolnik. But the Feb. 21 performance fulfilled the ballet’s promise. Perhaps, after a week-and-a-half of shows, the style had cohered. The conductor, Andrews Sill, brought out the lushness and colors of the score, and for the most part, did not rush, though the tempi remained brisk and bright. The lilting violin melody during Aurora’s wedding solo was particularly well played—bravo to the violinist. Sterling Hyltin’s Aurora was wonderfully fresh, skittish, delicate, and un-mannered, though she seemed a little bit nervous at first. Hyltin is one of the company’s most charming, feminine dancers. She has an innate sophistication and taste, but also a wonderful friskiness and light, happy jump. And she is appealingly free of airs, almost modest, despite the radiance of her dancing. Robert Fairchild, her Prince, danced with his usual ardor, to which he added a greater polish than I had ever seen from him. His partnering was, as always, devoted, impeccable. There was an air of happiness onstage. Everyone seemed to be dancing his or her best. Lauren Lovette was a delicious Ruby, sensual and vivacious and lush. Ashley Laracey’s Fairy of Generosity was confident and lyrical, with gorgeously stretched lines. Teresa Reichlen, stepping in for Rebecca Krohn, radiated energy with her back, her head, her milky arms, one movement melting into the next. Lauren King, as Princess Florine, broke through her usual cheerful but slightly tense demeanor, arms fluttering, eyes engaged, chest and shoulders suggesting a fluttering heart. It was a charmed evening. Shortly afterward, it was announced that eleven dancers had been promoted just as the performance was about to begin. Perhaps this explained some of the exuberance to be seen onstage. Hard work, form, perseverance, precision, belief: it all pays off. A brilliant way to finish the season. From corps to soloist: Lauren King, Ashley Laracey’s, Megan LeCrone, Lauren Lovette, Georgina Pazcoguin, Justin Peck, Brittany Pollack, and Taylor Stanley. And from soloist to principal: Adrian Danchig-Waring, Chase Finlay and Ask la Cour.